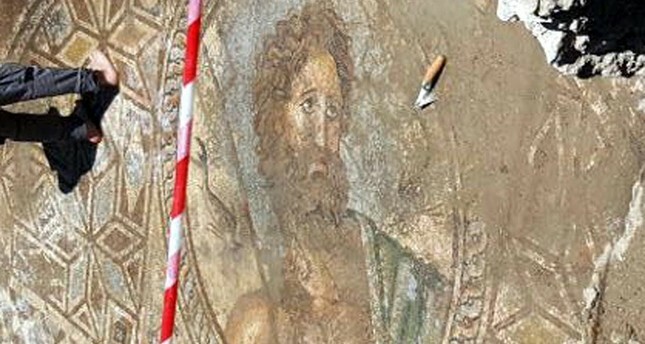 A mosaic with a picture depicting Poseidon, the Greek "God of Sea", has been discovered in Yumurtalık district of central Adana province on Saturday. According to Doğan News Agency, the mosaic was unearthed during an excavation by Osmaniye Korkut Ata University Archeology Department students at the Aigeai Ancient City in Yumurtalık district. There was also a quote written in Greek on the mosaic, which read: "Hail to all those who wash."
Currently, the archeological research is being conducted on four areas with mosaics at the Aigeai, which was an ancient port city dating back to B.C. 2 and held a strategic importance. It is also known as 'Kilikya Pedias'. The excavation at Aigeai ancient city had began after it was given particular attention by the former Culture and Tourism Minister, currently EU minister, Ömer Çelik.